Professionalism entails the conduct, aims and qualities that characterise a profession. The term is also used to describe education and training standards for the knowledge and skills necessary to perform a specific profession. In practice, professional standards of practice and ethics are agreed upon and maintained by recognised associations. In the past, professionalism has not occupied a central place in built heritage discussions, policy and research. Recent changes in terms of public attitudes and sustainability concerns have had a cumulative impact on the requirements for professionalism in the built heritage sector. The future success of the sector will depend on the availability of adequate professionals and an appropriately skilled workforce. In practice, the built heritage sector involves much more than interventions to conserve, preserve, rehabilitate or restore a heritage structure. Bringing a project to fruition begins with the formulation of a policy, proceeds to the design and execution of intervention strategies and ends with ongoing maintenance of heritage structures and related future programming. This process requires sufficient interactions between different professionals to obtain a common vision and hold that vision throughout a project. At the same time, the sustainability of the sector is also defined by effective governance, societal support and cultural rationales. 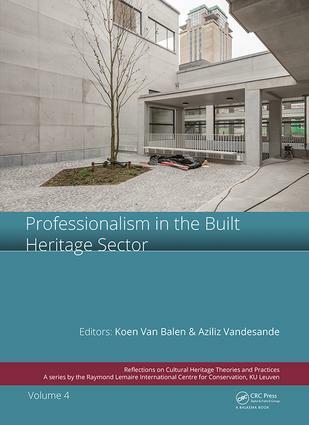 Professionalism in the Built Heritage Sector contains reports on the lectures of the international conference organized by the Raymond Lemaire International Centre for Conservation (Leuven, Belgium, February 5th-8th, 2018). The contributions in this volume meet the increasing demand for shared information to support the transition towards a more sustainable conservation process. The volume consists of three main parts that deal with practice-led research or scientific research: "Profiles and capacities", "Education, training and quality labels", and "Obstacles and changes". Prof. Koen van Balen and Dr. Aziliz Vandesande work at the Department of Civil Engineering and Raymond Lemaire International Centre for Conservation at the KU Leuven, Belgium.